The Ohio community that looks like a New England village. Visiting an Irish community that isn't Irish. Authentic Viking Festival held each year in Ashville, Ohio. Places to see in historic downtown Westerville. CENTRAL OHIO includes not only the capital city but is also the largest concentration of people and economic activity in North America. Columbus is surrounded by an interstate outerbelt that allows visitors from anywhere to quickly move from one village or town to another. Communities surround Columbus, have prospered because of their unique qualities and close proximity to Columbus, making each of them unique destinations in themselves for visitors or vacationers traveling through the area. Even municipalities further out have seen recent growth as bedroom communities offering unique living and visiting experiences. Shopping is always an important consideration when visiting certain areas. Central Ohio has several destination shopping areas worth noting. One of the premiere shopping destinations is Easton Shopping District. This is the model for village-style shopping on a large scale. Another major shopping area is Polaris just north of Columbus. If you're a connoisseur of food shopping, then you have to check out the new Market District developed by Giant Eagle. This is a food shopping destination and is only 1 of 4 at this time in the entire country and the only one in Ohio. Located in the recently renovated Kingsdale Shopping Center in Upper Arlington, Market District has fresh foods from all over the country and fresh produce from far away spots around the globe. Besides the usual grocery store items, you can find over 400 types of cheese, coffee beans roasted to order, grind-your-own peanut butter from a variety of nuts, and a large wine selection. Fresh, oven-baked foods are available for either take-out or dine in. The Columbus Zoo & Aquarium is one of the nations top zoological gardens and a must see for anyone visiting Central Ohio. The Columbus Zoo and Aquarium is open year round and always has something special for visitors. The zoo is ranked as the #1 zoo destination by USA Travel Guide and is best known as being the hometown zoo for America's favorite wild animal guy: Jack Hanna. Most visitors won't ever see Jack on the grounds, although he does make appearances. What visitors will see is his foresight in creating a visitor's destination entertainment / education center that revolves around the creatures of the world, similar to Walt Disney's Animal Kingdom theme park in Orlando. Columbus and Central Ohio offers an ever growing number of miles for local bicyclists. Columbus has about 48 miles of completed bike trails, primarily along the streams and rivers of the city. An additional 10 miles should be completed in the next year or so. The goal is to have about 165 miles of trails winding through the Central metro area that hook up with many miles of local networks in the suburbs and neighboring towns. For those looking to get involved in organized activities, Central Ohio is home to the long-time favorite Tour of the Ohio Scioto River Valley, a 210 mile weekend trip from Columbus to Portsmouth and back. Pelatonia is a new bike tour organized to raise funds for a cancer cure. 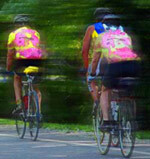 For more current information about other organized events, check out the Ohio Cycling web site.